Couture Bridal Photography is the top photography studio for wedding photography at the Boca Raton Resort. Couples from around the world choose the Boca raton Beach Resort for some of the most luxurious weddings in Boca raton, Florida. As one of the most iconic wedding venues in South Florida, the Boca Raton resort is one of the top wedding venues in the State of Florida. Couture Bridal Photography is the most preferred wedding photography studios in Boca Raton for couples getting married at the Boca raton Beach Resort. I am the owner of Couture Bridal Photography. As the most sought after wedding photography studio in Boca Raton, Florida I am honored to have my wedding photography held in such high regard. I began my journey into the world of photography at the age of 16 and have studied the art and science of photography for over 20 years to develop my own distinct wedding photography style. My Style of wedding photography is a blend of photojournalism, editorial, illustrative, fashion, glamour and contemporary bridal portraiture to create the most spectacular and detailed account of the couples emotions, and moments throughout a wedding day. As a master photographer specializing in Wedding Photography, I am proud to be one of the most recognized wedding photographers in the United States and around the world. As an internationally recognized award winning wedding photographer, I am even more honored to photograph weddings at the Boca Raton resort more than any other wedding photographer in South Florida. I love the dynamics the Boca Resort offers brides and grooms for their engagement and wedding photography. The beachside resort and the marina side offer brides and grooms the most diverse options and backgrounds for beautiful portraits before, during and after the wedding day. The Boca Resort offers the most places for amazing wedding photos. As the most popular provider of wedding photography in Boca Raton, the Boca Raton resort is not the only location where I provide wedding photography to couples getting married in Boca Raton at. I am one of the most popular wedding photography vendor at the Addison and Waterstone Resort and Marine. I have also photographed weddings at Pavilion Grille, The Loft at Congress event venue, Lakeside Terrace, Boca raton Marriott at Boca center and the Boca raton Museum of art. Boca Raton offers venues for any wedding style and budget. 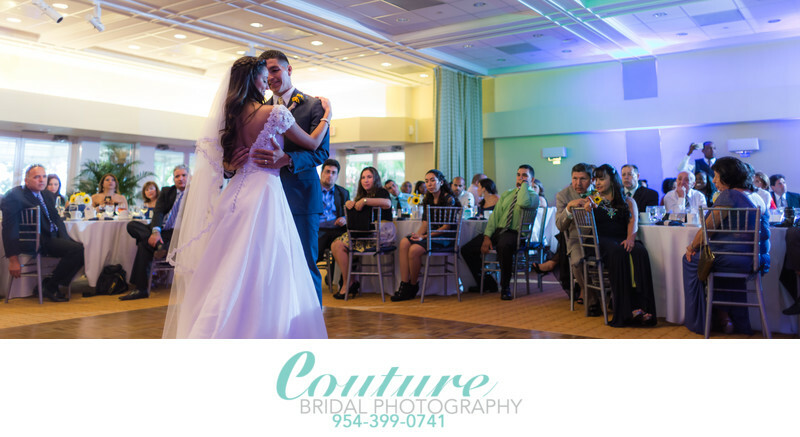 Couples getting married in Boca Raton choose Couture Bridal Photography for the best Wedding Photography pricing and packages in Boca Raton. We offer an extensive collection of wedding photography options to fit a variety of wedding planning budgets and personal tastes at a bargain compared to other Boca raton Wedding Photography studios or Photographers. Couture Bridal Photography is the most popular wedding photography studio specializing in distinct artistic documentary wedding photography at the Boca Raton offering the best prices and optional wedding photography services in Boca Raton and surrounding south Florida. We are also the only wedding photography studio in Boca Raton offering completely customizable wedding photography packages and convenient interest free wedding photography payment plans to reduce the stress and financial strain of planning a wedding. Location: 501 E Camino Real, Boca Raton, FL 33432. Keywords: Boca Raton (24), first dance (42), Lakeside Terrace (15), Palm Beach (114). 1/80; f/1.8; ISO 640; 28.0 mm.